Soften Frown Lines and Wrinkles With Botox Injections at Ariba Med Spa! 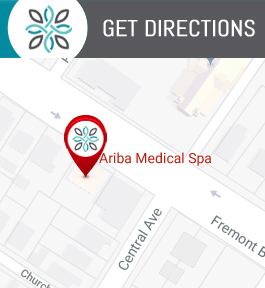 The Best Med Spa Near You in Silicon Valley. We are Conveniently Located at 37553 Fremont Blvd, Fremont, CA 94536. As you age, wrinkles around your eyes and forehead can become more prominent, detracting from your natural beauty. At Ariba Medical Spa in Fremont, California, Dr. Tariq Mirza and his trained staff use effective Botox® Cosmetic treatments to help you enjoy younger-looking skin with minimal discomfort. Call or schedule an appointment online today to enhance your natural beauty with Botox. Botox is a safe, FDA-approved treatment for wrinkles and fine lines on the forehead and around the eyes. It’s one of the most popular and effective cosmetic treatments among both men and women. Botox injections contain a small amount of purified botulinum toxin, a substance made by bacteria. When injected into the face, it blocks nerve signals to the muscles. That causes the muscles to relax temporarily, easing away the appearance of wrinkles, like crow’s feet or frown lines. Botox is commonly used as both a treatment for wrinkles and to help prevent wrinkle formation. Adults of all ages use Botox regularly to improve their appearance. What should I expect during Botox treatment? During your Botox treatment, Dr. Mirza, or one of the trained professionals in his office, will use a small needle to inject Botox in 3-5 places around the treatment area. Overall, your treatment should take around 10 minutes. Because the staff of Ariba Medical Spa is experienced and well-trained, you should experience minimal discomfort with quality results. If you’re worried about pain, your specialist can apply a numbing cream to your face, so you don’t feel the needle. What should I expect after Botox treatment? After treatment, you can immediately return to work and all other activities. No one will be able to tell that you just had a Botox treatment. Botox results appear within three days. You should see your best results, including smoother, younger-looking skin, after a week. Contrary to popular belief, Botox should not affect your ability to make facial expressions, and your results should look natural. The benefits of Botox can last up to four months. You can schedule regular Botox treatments to maintain results and even help results last longer. Many patients see even better results after repeated treatments. Botox treatment at Ariba Medical Spa is convenient, safe, and effective. Call or schedule an appointment online to enhance your natural beauty and enjoy younger-looking skin.